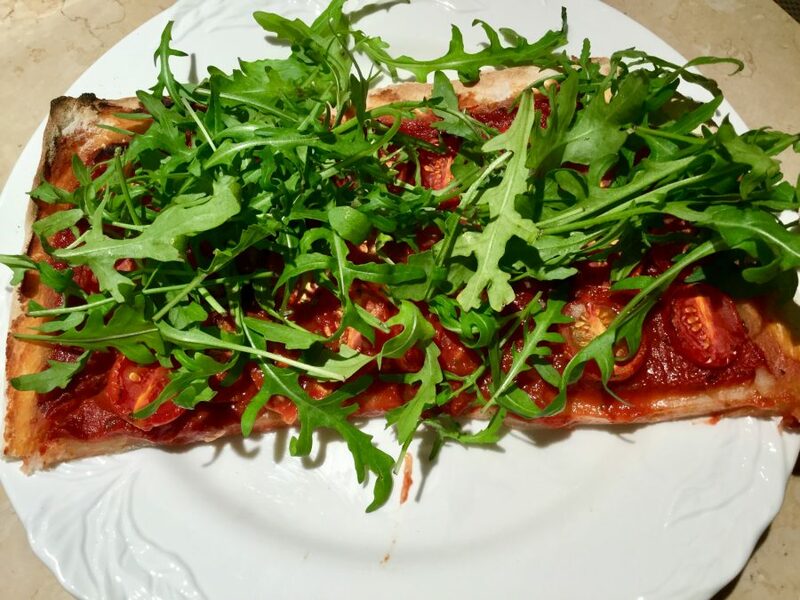 Homemade sourdough pizza is an eye-opening experience, with so much flavour in the dough and a crispy chewy texture to the crust. Of course, if only I had a wood-fired pizza oven I could add a smokey note, toasted crust edges and more intensely caramelised topping. A girl can dream can’t she? 1. Prepare the sponge by mixing the starter with 120g filtered water and 120g flour. This is a 1:1:1 starter preparation, but other builds are fine too. Cover the bowl with clingfilm (plastic wrap) and let it sit at room temperature for 4-8 hours until roughly tripled. 2. 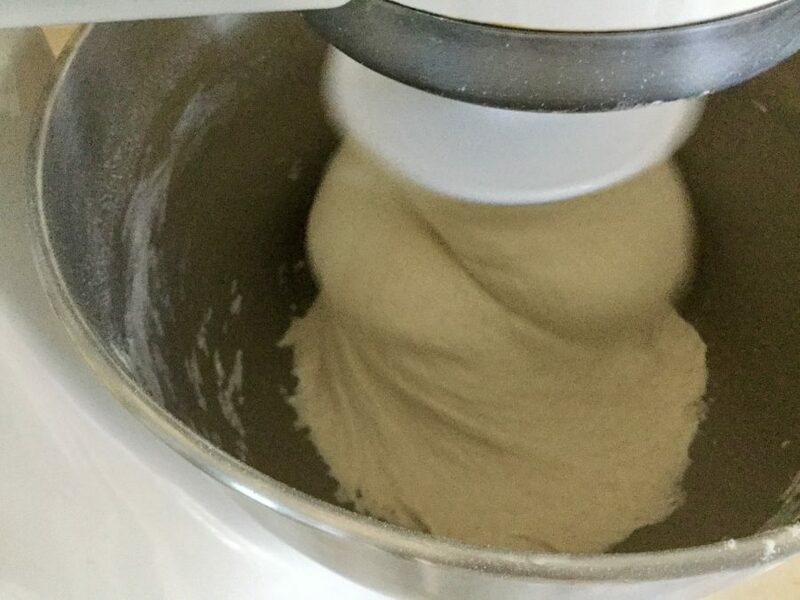 Now, mix all the ingredients together by hand, or in a mixer with the dough hook attachment for 5-10 minutes, until everything is incorporated and forming a ball around the hook. 3. 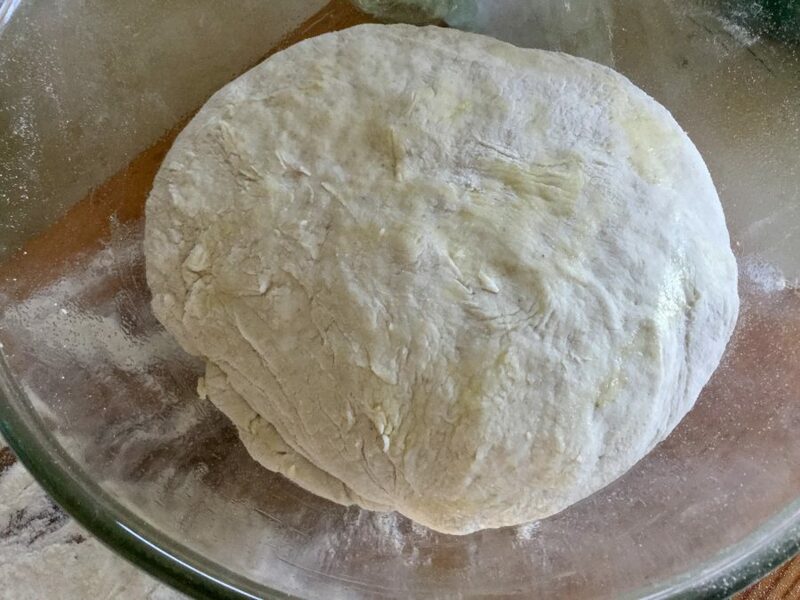 Scrape the dough out onto a floured counter and knead it for 3-5 minutes, adding a small amount of flour until the dough is manageable, but still sticky. 4. Lightly oil a bowl, then lay dough top side down in the bowl and cover with oiled clingflm (plastic wrap). 5. Let the dough rise until it has approximately doubled. 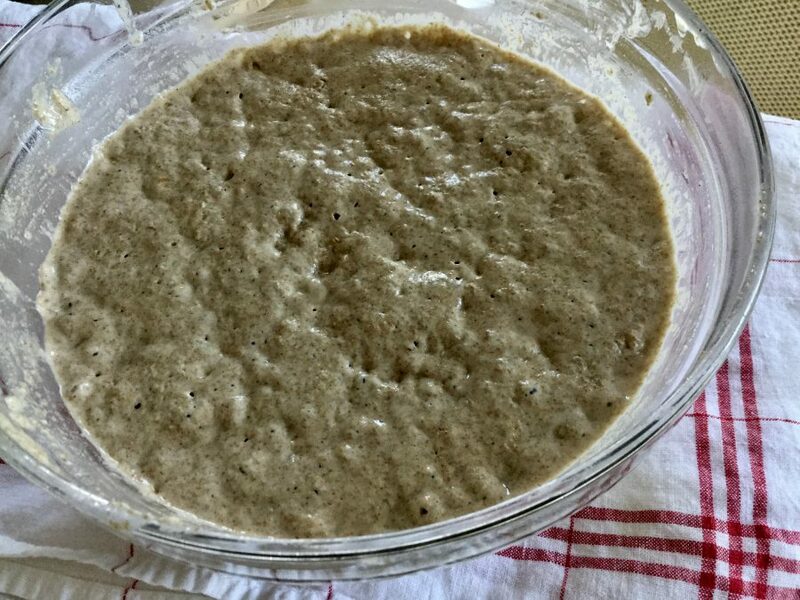 Alternatively, you can leave the dough at room temperature for a few hours and then put it in the refrigerator for a day or so, and finally pull it out when it is fully risen or close to fully risen and just needing a few more hours at room temperature. 6. When the bulk fermentation is finished, lightly oil a sheet pan and your worktop. 8. Form each piece into a ball by folding the sides of the piece inward. Then hold the ball in one hand with the taut top on your palm, while you pinch the bottom pieces together with your other hand. 9. Place the balls in the oiled pan seam-side down, and cover with clingfilm (plastic wrap) or put the entire pan in a plastic bag. The final proof can be at room temperature for 45-90 minutes or in the refrigerator for 8-12 hours. It’s at this point, I’ll freeze any additional dough. 10. 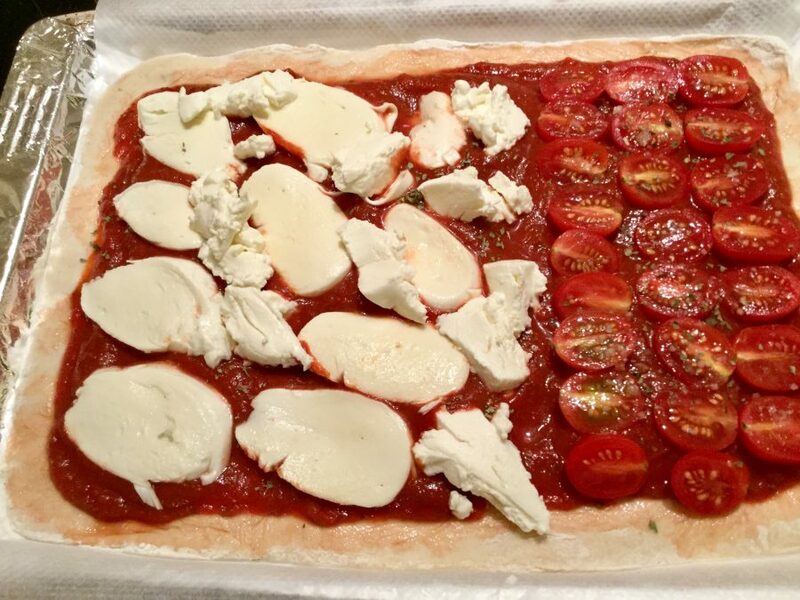 Before the dough has finished proofing, set up your toppings and the area where you will be stretching and “decorating” your pizza. 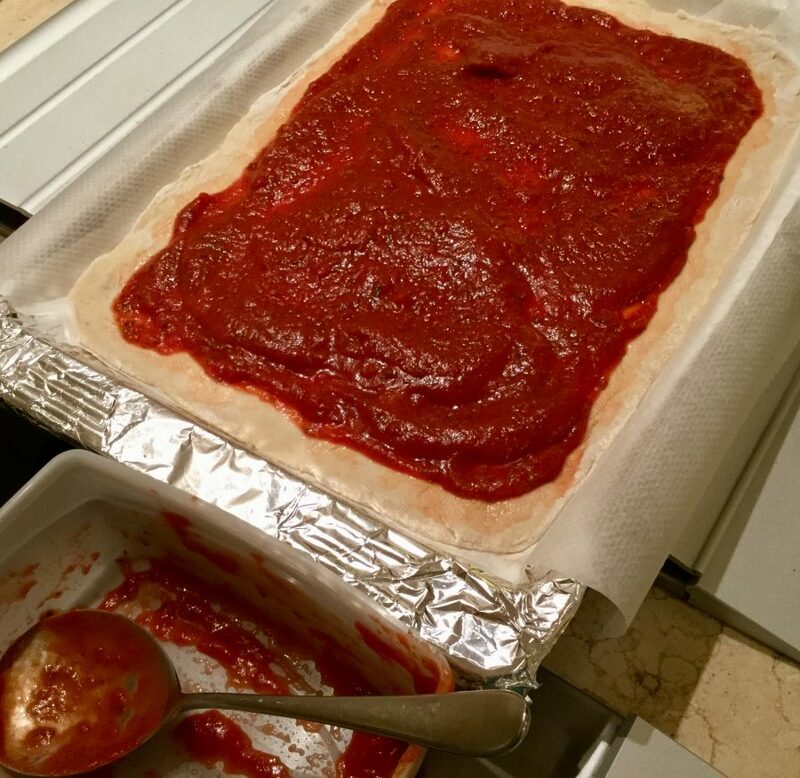 My preferred pizza sauce is my home-made tomato one. I make it ahead of time, and simply pull it out of the refrigerator to warm up a bit when I’m setting out the toppings. 11. About 30 minutes before your dough has finished proofing, preheat your oven to 260C/230Cfan/500F/gas mark 10, using the top shelf if you have a top grill (broiler). 13. 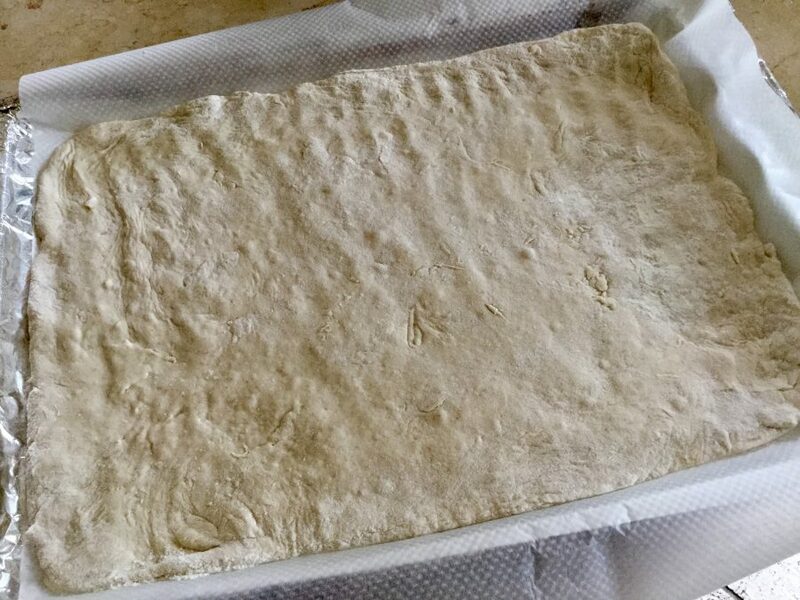 Lay your pizza dough on a piece of floured parchment paper. If necessary, stretch and adjust the dough a little more. 16. 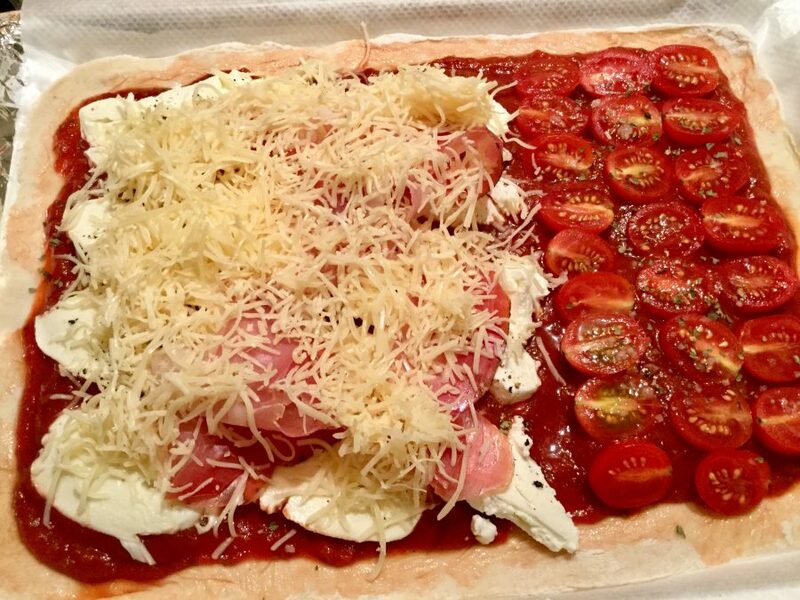 Now top your pizza dough to your liking and put it in the oven for 7 minutes, then switch to the grill for 1 minute more. This will brown the top of the pizza and caramelize the sugar in the toppings. 17. 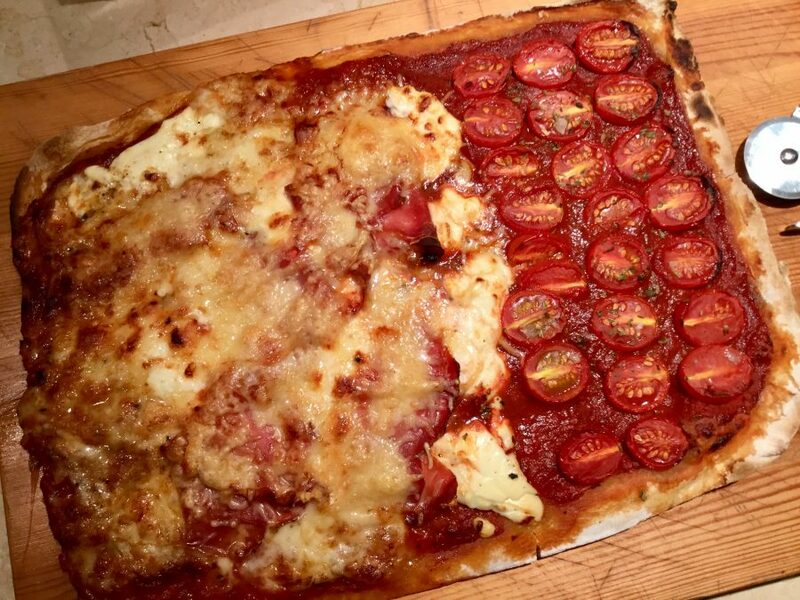 Remove the pizza from the oven and enjoy! Repeat process with next pizza. 1. As above, I often make two large rectangular pizzas to share among four/five rather than individual ones simply because it’s quicker. 1. Heat a large saucepan over a medium heat. Swirl around the olive oil to coat the pan and, when the oil is hot, add the shallots, garlic and red pepper flakes. Stir constantly until the shallots are translucent, around 2-3 minutes. 2. Pour in wine and cook, again stirring for 1 to 2 minutes to evaporate some of the alcohol. Stir in the tomato paste and cook for 1-2 minutes before adding the tomatoes, salt and pepper and bring to simmer. 3. Reduce heat to medium-low, crush the tomatoes lightly with the back of a spoon as they cook, stirring occasionally for a minimum of 60 minutes until the sauce thickens. Liquidise sauce. 4. If you’re not going to use it right away, it’ll sit happily in the fridge for a week, or the freezer for a month.